Monday 11th January 2010. Maurice Park, Maspeth, Queens. About to go running for 1 hour and 25 minutes. Hoping this will be about 11 or 12 K but no idea. (Later that day…) Hurray!!!! Jogged for 1.5 hours at a slow and steady pace. Hopefully I did about 12K. Feeling great. Lots of stretching afterwards on Yid’s yoga mat. Tuesday 12th – off. Arrived in Dallas! Wed 13th – 15 minutes yoga first thing in the morning. Then about 3 miles or 5K in Irving, Texas in the afternoon from Eve’s to Gold’s gym (where I used to do kickboxing many, many years ago) then back via Santa Fe Trail. Fabulously warm weather — about 55 degrees F which meant only ONE layer of jogging attire instead of the usual 3-4 layers. Felt light as meringue! Thurs 14th – Power walk around White Rock Lake with Tech. Three miles maybe? There was nobody on the Lake because the weather was cloudy and drizzly. We loved it. Friday 15th – off. Trip to St Louis. 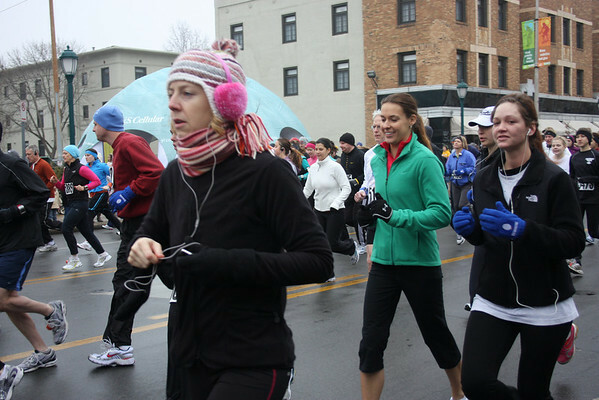 Saturday 16th – 10K frozen buns run race in the Loop. Starting at Blueberry Hill the route went up Delmar to Old Bonhomme road and back down Blackberry past U city high to Vernon and finally ending by the U city library. I thought I knew this terrain, after all it’s the neighborhood where I spent the first 18 years of my life, but as one fellow runner commented, “even the flat parts were hilly!” Still, I finished in 1 hour and 6 minutes – yeah! Here’s a photo of me at the beginning. Not looking too bad, right? But I was overdressed and purple as an aubergine by the end. Though I’m not competitive whatsoever, I found myself neck and neck with a 60 year old man during the last stretch. Suddenly he started racing and I wasn’t about to let him beat me so stepped it up and gave it my all. Just before the finish line he tripped and fell down – poor guy! Except perhaps for his ego, he was fine. That’ll teach him not to mess with me! A special thanks to Mom and Dad for taking pictures and cheering me on at the finish line. Sunday 17th – ATLANTA. Day off. This entry was posted on 11 January 2010 by ladymissmba. It was filed under Half Marathon training 2011 .